A good barn and lots of Learning to Listen Sound animal toys can be used for a million different therapy activities. But what about families who do not have a barn or animal toys at home? Why not make your own in therapy? 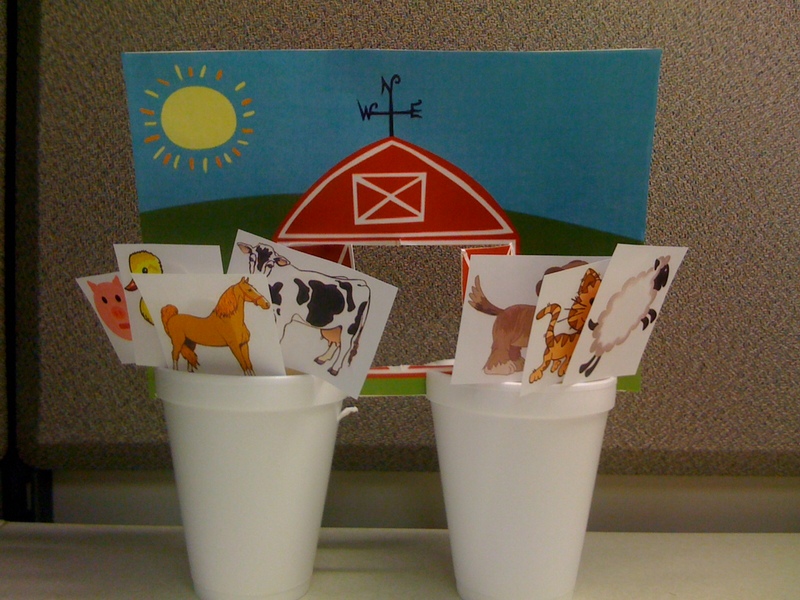 Print out the clip art barn (either directly onto cardstock or glue it on), cut out flaps for the doors. Cut slits into the tops of two disposable cups to create the stand for the barn. Glue animal clip art to popsicle sticks/tongue depressors, and store them in the cups. Sing Old MacDonald — does the child respond physically to music? Does he attempt to “sing” along? Hide the animals around the room. Give directions with prepositions (“the cow is UNDER the blue chair”). This entry was posted in Elizabeth Rosenzweig MS CCC-SLP LSLS Cert. AVT and tagged Activities, Auditory Development, Auditory Verbal Therapy, Children, Cognitive Development, Language Development, Parents, Professionals, Speech Development, Therapy Tips, Toddlers. Bookmark the permalink. ← What Is a Cochlear Implant?